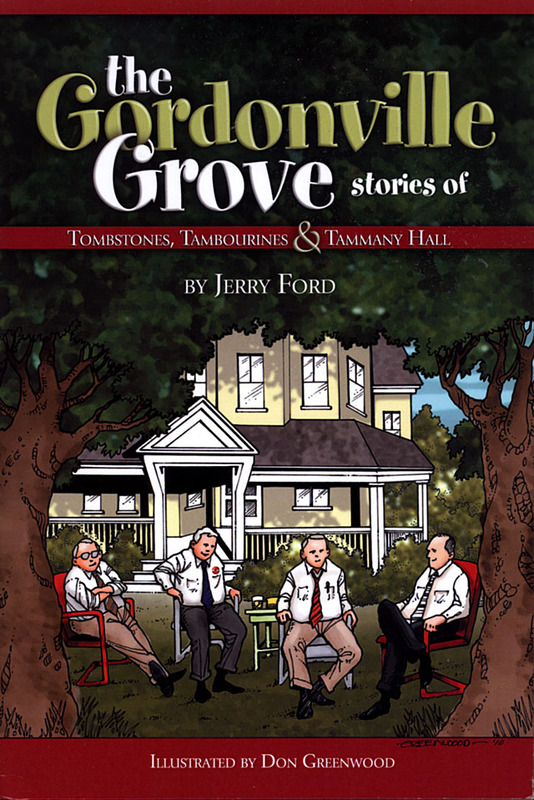 My old high school campaign manager, Bill Hopkins, said I needed to read Jerry Ford’s new book, The Gordonville Grove: Tombstones, Tambourines, & Tammany Hall. I didn’t know if Bill really liked the book or if Jerry was giving him a cut of the sales, but I headed over to Amazon anyway. The book arrived in the mail this morning and I knocked it off in a couple of hours. Jerry was a few years older than my crowd, so I knew him by name, but not really in person. His family ran Ford & Sons Funeral Home, so I mostly knew him from chasing his ambulances. See, back before cities got fancy, it was customary for funeral homes to run to wrecks and other unfortunate happenings because they were about the only folks who had a vehicle large enough to carry a patient. 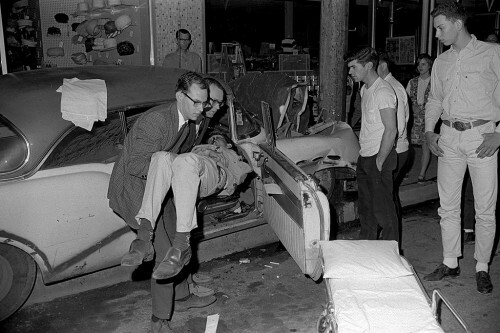 John Carpenter, left, and Walter Joe Ford remove Dale Smith from a car in which he was a passenger when it struck a pole in front of the Montgomery Ward store on Main St. in 1966. Smith had a broken jaw. John “Doc” Carpenter eventually became Cape County Coroner. Even though he was from Sikeston, he and I were good buddies from Scouts and debate. As early as his teens, Doc said he wanted to work in the funeral industry. He died of colon cancer in 2000. Walter Joe Ford, was author Jerry Ford’s older brother. 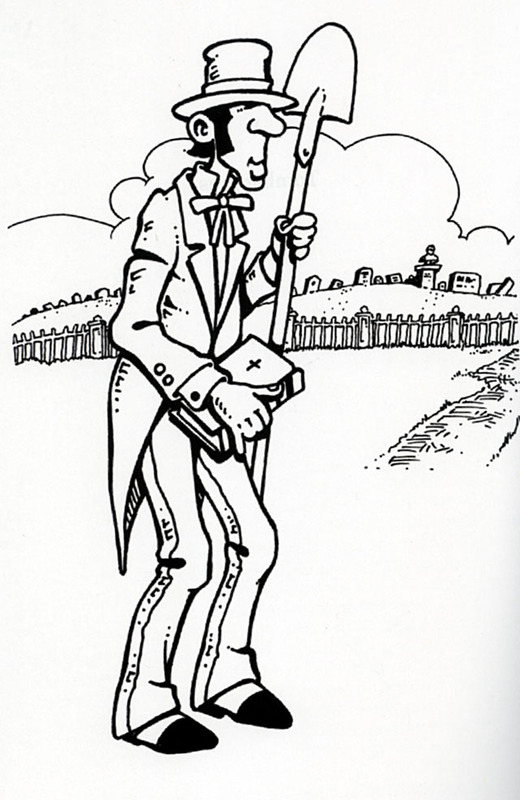 Cape artist Don Greenwood illustrated the book. I’ve been a fan of his for years, particularly after he was kind enough to let me use one of his illustrations for my bike blog logo. Gordonville Grove may not be for everyone. You almost have to be from the area to appreciate many of his stories. On the other hand, I found myself putting names to some the characters he left nameless to protect the not-so-innocent. The chapter titled The Deal made the whole purchase of the book worthwhile. I learned something I had never known about Cape. Up until the mid-60s, no white funeral home had ever buried a black person in a traditional funeral setting, Ford writes. 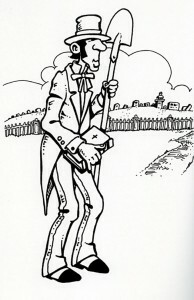 The only exceptions were one or two private burials of domestic workers employed by some of Cape’s wealthiest families. Sparks Funeral Home was the only option for most blacks. At the request of a respected member of the black community, Jerry’s father agreed to see if the color barrier could be broken. The funeral industry is fiercely competitive, but all of the local funeral directors brokered a deal: the first black family that wanted a funeral in one of their establishments could pick the one they wanted. After that, all of the homes would go into a rotation so that no one establishment would suffer the “stigma” of dealing with blacks. As it turned out, it was a non-issue. Cape Girardeans had no apparent problems with formerly white funeral homes holding black funerals. Jerry’s Ford’s 13-piece swing band has played throughout the Midwest for over 50 years. 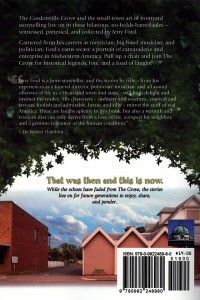 He writes about playing in all of the local clubs like The Purple Crackle and The Colony Club. He’s performed with or watched most of the big names of the era: Henry James, Harry Ranch, Woody Herman and his Thundering Herd, The Blue Rhythm Boys, Bob Sisco and Jack Stalcup. The Fords, Limbaugh and the Rust families were the big political movers and shakers in the Cape community. The Fords were Democrats, and the latter two were Republicans. Jerry writes about how politicians from the different parties could work together for the common good without the partisan gridlock we see today. The class of ’62 will remember Jerry’s younger brother Don Ford, one of the nicest guys around, sadly taken from us by cancer way too soon. The book was very enjoyable. Can’t wait for his second one. I knew (or guessed) most of the ones who were nameless and squeezed a couple of the names I couldn’t figure out from Jerry, with the provision of death if I ever told!!! The Ford family is awesome! Oh my you do bring back the Memories. Doc and I were good friends and we were on the camp staff at Llewelyn together. I was the life guard and I can’t remember what he did. But we both had a crussh on the camp nurse. We would pull stunts that back then was outter limits like borrowing the canoes to go across the river to the girl scout camp to visit the girls and taking off in my car to visit the local honky tonks. He was a delight to be with especially smoking cigars at 16 (and before)!! i am so sorry to learn of his death. he was a delightful individual!! Doc was one of the most mature kids I ever knew. I mentioned that he knew he wanted to be a funeral director from time first time I met him when we were about 14. Do you remember the vintage Scout uniform he would wear from time to time? It had to have been from WWI days. His hair line started receding while he was in high school. That’s evident from the photo of him at the wreck. I always looked forward to running into him at Order of the Arrow events. I can’t wait to get and read the book(s) by Jerry. I have admired him “forever”. We were in the same class at Central and neighbors for a while. I came across this article and it brought back ancient memories. Jerry, you will never remember me unless I give you the name of a friend. Please send me your e-mail address so we can chat or friend me on facebook. The phrase “swoop and scoop” has a different meaning for me. From 1967 to 1970 I worked for one of the Ford family’s competitors, Walther’s Funeral Home, doing just about every odd job that needed doing except embalming. Among those jobs was riding along on ambulance calls, which were little more than “swoop and scoop” runs. What an appalling experience it was, by today’s standards, although at the time it was standard practice. We had no on-the-job first-aid training (all I had was what I brought from my own advanced first-aid course) and carried no equipment on board except an oxygen tank: no splints, cervical collars, or bandages, etc. Nothing. Could have been hauling sacks of potatoes for all we were prepared to do. It seemed clear to me that Virgil Welch, the home’s manager, didn’t really want to be in the ambulance business but had to be in order to stay competitive. What a relief it was when George Rouse opened Cape County Ambulance (where I also worked for a short time).